Prime Minister Justin Trudeau is delaying the legalizing of cannabis until Oct. 17 to give the provinces more time to prepare for a “smooth” transition once the new law comes into force. At a news conference on Wednesday to mark Parliament’s summer break, Mr. Trudeau said provinces asked for more time to prepare their retail cannabis outlets, online mail-delivery systems and production regimes before marijuana can be legalized in Canada. 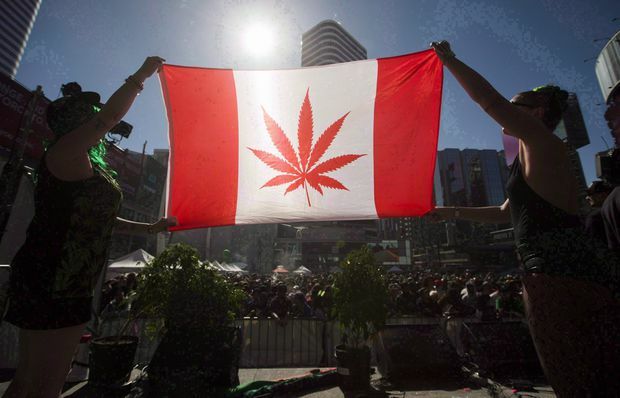 Two people hold a modified design of the Canadian flag with a marijuana leaf in place of the maple leaf during the ‘420 Toronto’ rally in Toronto, on April 20, 2016. Prime Minister Trudeau is delaying the legalizing of cannabis until Oct. 17 to give the provinces more time to prepare for a ‘smooth’ transition once the new law comes into force. The government had initially aimed to open up the market for legal cannabis within 12 weeks of the adoption of Bill C-45, which the Senate passed on Tuesday, but the new target date gives the provinces and producers 17 weeks to get ready. “This is something that we want to get right,” Mr. Trudeau told reporters. Mr. Trudeau also said it would be “illogical” to launch any process to pardon those with criminal records for possession of cannabis while the act remains a criminal offence. How cannabis came to be a banned substance in Canada is still unclear. It was added to the schedule of restricted drugs in 1923, at a time when there was more concern over opium in Canada than marijuana. After Question Period on Wednesday, NDP MP Don Davies tried to pass a motion to “immediately provide pardons for those burdened by criminal records for cannabis offences that will soon be legal.” The motion did not receive unanimous consent and failed. Earlier in the day, Justice Minister Jody Wilson-Raybould cautioned Canadians that recreational marijuana use is “not legal yet” and existing laws remain in place until the date of legalization. “Cannabis for non-medical use is not legal yet. The law still remains the law,” Ms. Wilson-Raybould told reporters. Ms. Wilson-Raybould said provinces can pass their own laws regarding home cultivation, which the federal legislation allows in small amounts. This comes in response to opposition from Quebec and Manitoba, which want to ban homegrown plants. But she suggested provinces could face legal challenges to such bans. “It is not the intent of the federal government to challenge provincial laws. That is not our place. However, there may arise a challenge by an individual of another jurisdiction’s law,” she said. At his news conference, Mr. Trudeau said the government is treating cannabis the same as alcohol and tobacco. “We know that it’s allowed to make your own wine, to make your own cigarettes, to grow your own tobacco. Very few people do this, but some do. They do it in a controlled way that is regulated by law,” he said. In Tuesday’s historic vote, Parliament changed Canadian law to lift the 95-year-old prohibition on cannabis and free millions of adults to openly smoke, ingest or grow the drug without fear of a criminal record. The adoption in the Senate of Bill C-45, the Cannabis Act, means a legal, multibillion-dollar industry is set to appear in Canada, which will join Uruguay as one of the few countries where cannabis is legal nationwide. The next steps will include releasing regulations for the cannabis trade, including approving edible products within a year, and working with Indigenous communities to smooth out the negative consequences of the transition to legal cannabis. All producers of cannabis will have to be licensed by Health Canada, while provinces will oversee the distribution of the dried cannabis and oils to the retail market. Canadian adults (the minimum age varies by province) will be able to carry up to 30 grams, with stiff new penalties for providing the drug to minors. Revenue from the legal market are expected to be used, at least initially, to cover costs related to policing, enforcement, setting up public distribution networks and creating public-awareness campaigns. Cannabis will be subject to an excise tax of $1 a gram, or 10 per cent on sales of more than $10, with Ottawa keeping 25 per cent and the rest going to provinces and municipalities.